This video pick is not for the faint of heart! It shows an upclose view of what it’s like to glide down a mountainside at speeds over 100mph, just a heartbeat away from terra firma. Check it out! 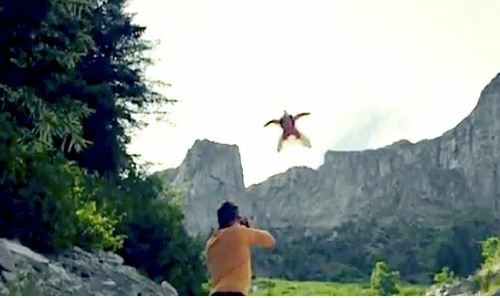 Unless you’ve been stranded on an island for a few years, you’ve undoubtedly seen footage of those brave souls who jump off mountains in wingsuits and dare to fly, at speeds well over 100 mph, just feet from the ground. Man’s quest for flight is getting that much closer to reality with each improvement in wingsuit design. And while you’ve undoubtedly seen some incredible footage, this short eight-minute movie about where leaders have progressed the “sport” will still leave you breathless. Multiple camera angles allow the viewer to follow world champion flyer Espen Fadnes of Norway from a variety of heart-pounding perspectives. Whether we’re staring off the edge of the cliff, taking his initial straight-down plunge, or just buzzing the rock outcroppings, canyon walls, tree tops, hiking trails—even a gondola filled with tourists—it’s one heck of a descent! For the rest of GrindTV.com’s story from Chris Mauro, click here.